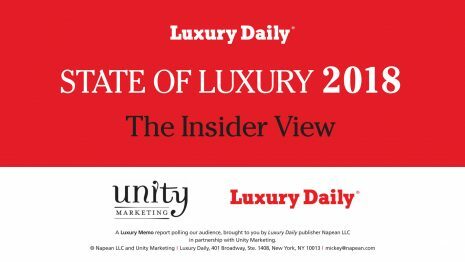 The rise of the digital economy simultaneously poses the biggest challenge and growth opportunity to the luxury business, according to the newly released “State of Luxury 2018: The Insider View” report from Luxury Daily and Unity Marketing that surveyed 599 decision-making luxury industry insiders. Among the many findings, the 40-page report also reveals that social media advertising and promotion is where the largest number of luxury goods and services brands will invest their advertising and marketing budgets in 2018, followed by Web site enhancements and Internet advertising such as Google AdWords. Survey respondents included senior luxury brand, retail and agency executives who subscribe to Luxury Daily, the world’s leading luxury business publication, and subscribers to research from Unity Marketing, one of the premier market researchers focused on luxury and retail. The report found that 68 percent of luxury goods brands now sell goods over the Internet, as compared to 62 percent in 2016. Further, the survey results also reveal that traditional print advertising is losing relevance to luxury brands as a means to reach the target customer. Only about half as many brands report that they will allocate advertising budgets to print this year versus social media. “The search is on for the next generation of luxury consumers and, increasingly, luxury brands realize that they must troll the Internet to find them,” said Pamela Danziger, president of Stevens, PA-based Unity Marketing and lead researcher in the study. This year’s survey found 58 percent of luxury goods and services companies will invest more on advertising and marketing in 2018, which is a marked improvement over the previous year. “This is a bellwether of strength in the luxury industry, as brands pick up the pace to attract new customers and communicate their branding messages through media that is most relevant to them,” Ms. Danziger said. This survey reveals that luxury insiders viewed the past year as a challenging one in business, but they see a better year ahead in 2018. “The insiders surveyed believe they have strategies in place to respond to the shifts in the market that will enable them to overcome the headwinds they faced over the last few years,” Ms. Danziger said. Priced at $595 for an individual download. The report also comes free with a new annual subscription to Luxury Daily that costs $349 (pick 1 year term subscription). Both are non-refundable purchases. The report includes detailed insights, plenty of charts for corporate sharing and action-takeaways. Get your PDF copy of the “State of Luxury 2018: The Insider View” now by clicking here (cost $595, non-refundable). Or subscribe to Luxury Daily for the annual $349 rate and get the report for free (pick 1 year subscription term, non-refundable, only new subscribers). Both purchases are non-refundable.